Whatever your design, we make you proud. "When we see a badge it often makes us think of a sign of accomplishment or in some cases a sign of authority. Badges are often given in the military for identification of rank, qualifications and achievement; fraternities often give badges to members of their society as a symbol of belonging to their group. Many times when companies are running advertising campaigns they will use custom made badges. Custom badges are a great way to get your group’s logo on clothing." Police, fire and security badges for caps, wallets, epaulet, uniforms and breast pocket. Shoulder flashes, breast pocket flashes, cap badges - all embroidered to your unique design. Military Style gold and/or silver bullion badges - a tradition that dates back to the 1700s. Metal badges are often seen as a form of identification. 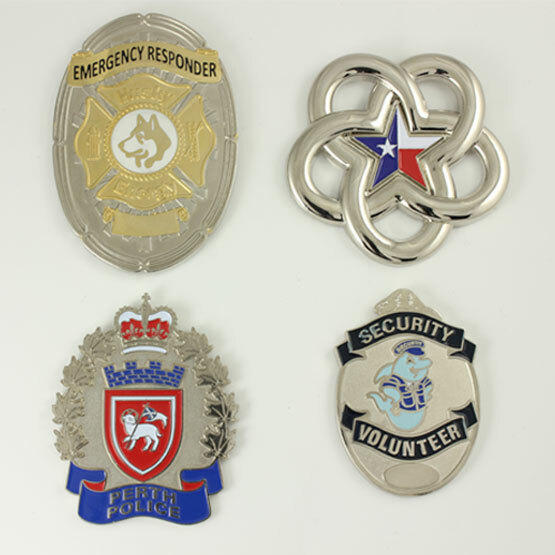 We have proudly produced thousands of custom metal badges for customers around the world. 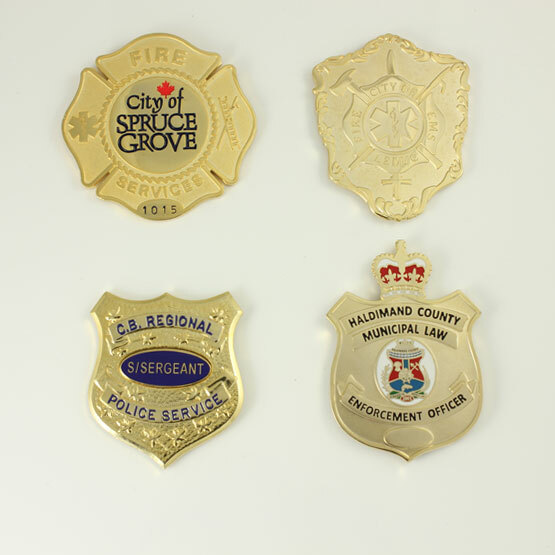 Each design is custom and most are still proudly worn today by police, fire, security and other public safety groups. Our custom metal badges must meet the demanding lifestyle that public safety insists upon. Confidentiality is a given, orders are only accepted when placed by the proper authority. Custom Metal badges come in many shapes and sizes: cap badges, identification badges with badge wallets, shoulder epaulets and many more. There are countless possibilities for these metal badges. Silver and/or gold plating is typical, but other platings are available too! Some people mix the two platings on the one badge. Similarly, there are many ways to affix the badges. Some people have screw posts for their caps, while others have a button clip for their wallets. And others send us a sample of their wallets or ID cases so that we can be sure their badge fits their existing wallet. When people think of the history of badges they are taken back into time, to the days of the Old West where the man wearing the sheriff’s metal badge ruled the town. These stories have made collecting badges a very interesting hobby for many people around the world. In the military the use of badges is a way to identify achievements gained during training. Badges are given to people of all ages. Children all around the world receive custom embroidered badges through social groups such as Scouts and Brownies. We know how important a custom made badge is to you and with nearly 40 years of experience making personalized badges we are sure that we can do justice to your project. From our time in the industry we have learned that badges have a wide range of uses. Whether you are creating a badge as a promotion or to identify authority, we wish to work closely with you on the creation of your custom made badge. You are our best source when it comes to finding out what your badge will look like. Our talented staff will iron out all the details in a quick and efficient way. We will take your needs and budget into account and come up with a project that will not only be cherished for years to come, but will fit within your group’s budget. We will walk you through choosing size, shape and materials. We hope the process will leave you feeling excited that your custom badge will soon show up at your doorstep. Our design staff is second-to-none and will bring your custom badges to life with our experience in creative perfection. International Coats of Arms designers will personally work with you so they may best help you communicate your message through a badge. During our time in this industry we have realized that everyone has a different story to tell; by working with you we make sure that all of our designs are one-of-a-kind. 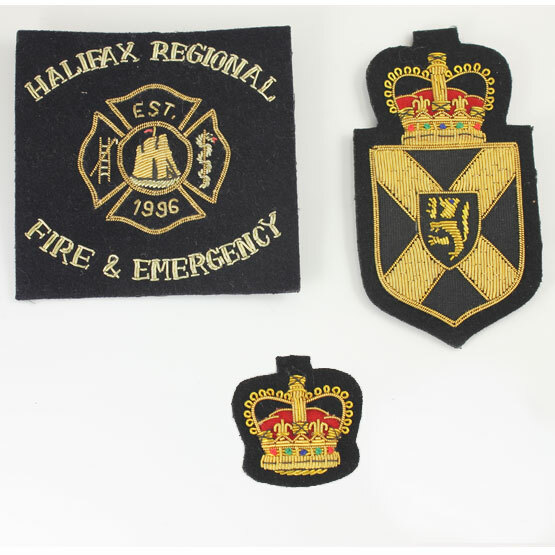 We can create Custom Embroidered Badges incorporating your current insignia, or help you design something new. In the past, we have supplied many groups with great looking badges. Personalized embroidered badges can be seen symbolizing groups around the world. Custom Embroidered Badges are timeless and people wear them with pride. Our badges are of the finest quality to be cherished for a lifetime. Stitch count is the key to these badges. The more stitches - the more the cost and the better the quality. It's that simple. Most people stitch the embroidered badge on the garments themselves, but an adhesive back is available. A long standing tradition in our proud military is the custom embroidered bullion badge. It's hard to determine when this tradition started as bullion regalia has been found as far back as the 1700's. Indeed, when historical uniforms are later found, the uniform material may be moth-ridden but the bullion badges are still intact. Yes, the thread does contain gold bullion but there is more value in the custom keepsake that the gold itself. Over many years, the gold bullion thread ages into a warm color that reflects it's antiquity. 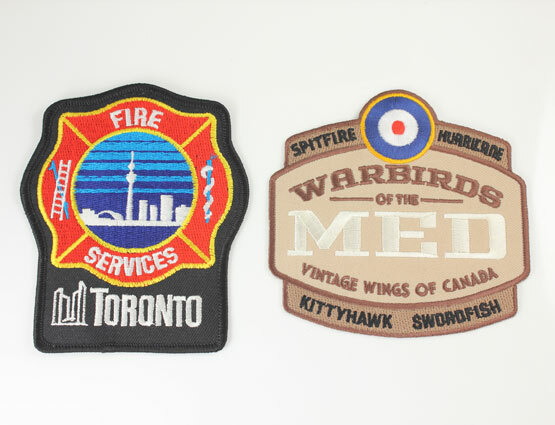 These thick heavy duty military style badges are typically sewn on other garments. The field of the badges can be any size.